Home Driving today The high-minded holier-than-thou just don’t get it. Some faults can make us happy. The high-minded holier-than-thou just don’t get it. Some faults can make us happy. This week marks the celebration of two of my favorite religious holidays: Holy Saturday and Purim. The two usually don’t occur so close together, but Passover is rather late in April this year. When I was a teenage altar boy, as I’ve mentioned before, the vigil service on the night before Easter was one of my favorite events. It would start about 11 p.m. on Holy Saturday. All the lights in the church would be turned off. If we were having a solemn high mass, there would be three priests: the celebrant, a deacon, and a subdeacon. In the dark of the foyer, the priest used a flint to get a small charcoal fire going. A few of the hot coals were transferred to a censer or thurible into which incense would be sprinkled, with the remaining hot coals used to light a wick or small candle. There was an air of mystery to this small huddle of men quietly chanting Latin prayers in the dark. After blessing the fire, we lined up at the door between the foyer and the nave of the church, led by the thurifer, an altar boy carrying the smoking censer. The subdeacon came next carrying a cross on a staff, followed by the deacon holding a three branched candle holder, accompanied by an altar boy holding the small candle, the only light in the church. Last in line, the celebrant. As the deacon went through the door, an altar boy used the small candle to light one of the candles on his candelabra. The priest’s voice cut into the darkness of the church: Lumen Christi. Light of Christ. Halfway down the main aisle the deacon stopped again for a second candle to be lit. Lumen Christi. Somewhat louder. Finally when the procession reached the front of the nave, the third candle was lit. Lumen Christi. Booming. And all the lights of the church were turned on in a blaze dispelling the dark. As an altar boy, I was privileged to see the light grow from the spark of a flint to glowing coals to a small candle to one, then two, then all three candles in the holder at the top of the priest’s staff to all the lights in the church illuminating a congregation of hundreds. The wonder and awe of that ceremony still move me 60 years later and 50 years after I left the Church. On the other hand, I recognize and do not celebrate the wrong that it was my gender that gave me entry to the male club who got to participate in this ceremony from the beginning. At the front of the church, the priest began to bless the Paschal candle by singing the Exsultet. I still admire the ornate decorations of this large candle, maybe about 1.5 inches in diameter and at least 3 feet high. It remains at the front of the church throughout the Easter season until Pentecost. In the Exultet, the sin of Adam and Eve is called a “happy fault,” felix culpa, because it meant that God became one of us to redeem us for that sin. Today I give a more secular interpretation to this theme. Our bodies, the bodies that fail us and get sick and die, those bodies are also a source of comfort even in a time of great loss. I’m not just talking about the ability to take refuge in hugs and comfort food. Nor about the ability to escape through drink, drugs, and physical pleasure. Not even about the distractions provided by our sugar-saturated, caffeinated, media-hyped society, which the high-minded and the holier-than-thou so loftily and mistakenly disdain. I’m talking about simple tears. We cry. We can cry because that’s the way our bodies work. The things that make us cry make us feel sad, but tears give us relief, even a kind of pleasure. Why else do we like sad music? And while we’re on that subject, for the benefit of the high-minded and holier-than-thou, without the physical world, without our bodies, there would be no music, nor laughter. If Holy Week commemorates God the Father allowing his Son to die a horribly painful death, Purim celebrates another bloody event in the history of the Jews. They had been living for decades in exile in Persia. Hamen, the king’s chief minister, hated the Jews and got permission to organize a pogrom to wipe them out. The king did not know that his wife Esther was Jewish. When her father Mordechai found out about Hamen’s plans, he asked Esther to intervene. She hesitated. To enter the king’s presence without advance permission could mean death. When she found out the Hamen planned to lynch her father before the pogrom, she overcame her fears and approached the king. Since a Persian king could not retract a decree once it had been issued, Esther convinced him to issue a new decree giving the Jews permission to defend themselves from their attackers. They mobilized and succeeded in killing all those who had come to kill them. Definitely an Old Testament story. Today Purim celebrates Esther’s courage as much as the lesson about being willing to fight in order to survive. 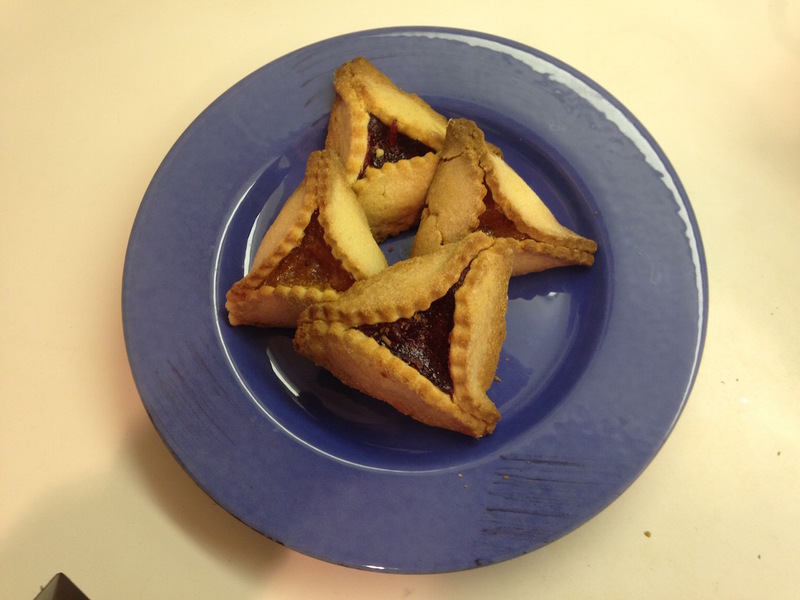 I must admit to enjoying Purim more for the hamentashen pastry than for its religious significance. A happy failing. Yes, but store bought hamentashen can’t compare to Laura Rivkin’s. As I miss her hamentashen I remember that she too had the courage of Esther. Are you old enough to remember getting a big Sears Roebuck catalogue in the mail? I enjoyed reading this. Thanks, Ken. What a wonderful name and what a wonderful time of year. Thank you for sharing these moving memories of holidays past shared with loved ones. For our family, this time of year (end of March) represents the beginning of a shared life with children. As a long time single parent, on March 25th, I received the long awaited telephone call from the adoption agency in Pennsylvania asking me to drive to Pennsylvania to receive the referral papers for my eldest daughter-to-be. After receiving the paperwork, and while driving back home amidst the spring flowers pondering the immense changes that were to take place , I stopped at a Chinese restaurant to show them the original paperwork written in Chinese and asked the Chinese meaning of my daughter’s name “Chun Chun”. It means “Eternal renewal” was the reply, and it was explained to me that this is the meaning of this time of year (spring or “chun tian”). A reminder of the accompanying emotion fills me to this day. . Happy Spring Time, Happy Purim, Happy Easter to you Ken. And parenthetically, as a small (perhaps miniscule) advancement of the Catholic church, Chunchun ( a female immigrant from China) , has taken her place as an altar server for the Easter vigil mass, outside of the church, helping to share the Easter light from the fire outside of the church into the dark church within.